Each month, we like to highlight a member of the NEIRG team so you can learn more about the people who support your personal and financial goals. 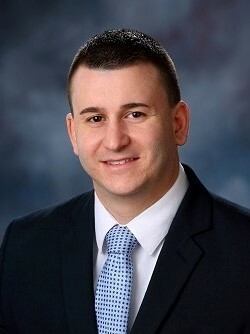 This month, we’d like to introduce you to Andrew DiNuccio, a Client Service Representative at NEIRG. He joined New England Investment & Retirement Group in March 2018 with a background in the financial service industry. In his role at the company, Andrew has responsibilities including opening new accounts and managing client requests. He is a dependable member of the team at NEIRG, with a positive, can-do attitude. In his spare time, Andrew likes to read, play sports and enjoy time with his dog, Leo. A: Green has always been my favorite color. Green is a peaceful color for me and it often puts my mind in a tranquil place. A: Weight lifting. I try to get to the gym 4-5 times a week for this. It is a peaceful place for me. A: Playing basketball. I like to play a couple times a week if I have free time. Q: What is the most-played song on your playlist? A: It changes frequently, but right now it is Eastside by Benny Blanco. A: Robert Greene. My favorite book by him is 48 Laws of Power. A: I enjoy spending my free time exploring new places with my dog. There are a lot of cool hidden spots on the North Shore. I love to find new places and check them out, especially anything along the coastline. A: Summer, I enjoy the warm weather and going to the beach.